Australia's Cameron Meyer won stage two of the Tour of Britain in Barnstaple by surging clear of Alessandro Tonelli, who moved into the overall race lead. Meyer and Tonelli were the last two riders left from the breakaway and held off a strong chasing pack in the final kilometre to contest the finish. Mitchelton-Scott's Meyer, 30, kicked up the left to catch out the Italian and win by one second. Yet second place was enough for Tonelli to take the leader's green jersey. Both he and Meyer are on the same time but the Bardiani-CSF rider leads due to better combined stage results, having finished three places in front of Meyer on stage one. BMC Racing's Patrick Bevin won the sprint from the chasing bunch to finish third and also claim third overall, with Hugh Carthy the highest-placed Briton in 10th. 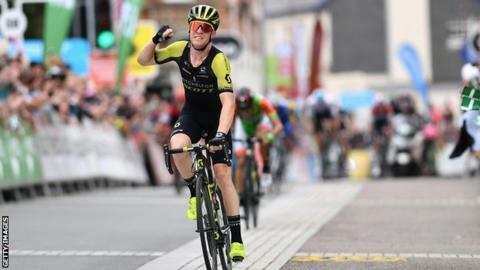 Tour de France winner Geraint Thomas rolled in more than three minutes down on Meyer, with six-time Grand Tour winner Chris Froome finishing nearly 12 minutes back. Both opted against competing in the Vuelta a Espana to race in Britain and rode stage two in support of Team Sky team-mate Wout Poels, who finished seventh to move into fourth overall. "I was not very confident because I've been caught in the last kilometre on a Tour of Britain stage before," said nine-time track world champion Meyer. "I was hoping there would be no deja vu and I'm very happy to hold on and take the victory. "We worked really well all day in all sorts of conditions and it was a great bike race with a thrilling finish so to throw my hands in the air at the end was pretty cool." Meyer and Tonelli helped establish a five-man breakaway with Matthew Teggart (Team Wiggins), Erick Rowsell (Madison Genesis) and Scott Davies (Dimension Data) early on in the 174.9km stage from Cranbrook. Britain's Davies attacked out of the group on the steep slopes of Challacombe Hill with 22.7km to go, taking the summit alone to claim the king of the mountains jersey, before he was reeled in and dropped by Meyer and Tonelli. Carthy and France's Julian Alaphilippe, who won two stages of this year's Tour de France, set off from the peloton in pursuit and were joined by several strong riders including Primoz Roglic, Poels and Bob Jungels. The chasers quickly cut the advantage of the leading pair but could not pull back the last 10 seconds in the final kilometre as the breakaway ultimately succeeded. Previous race leader Andre Greipel, who won stage one, was dropped on Challacombe Hill to finish more than six minutes down. Tuesday's stage three is another hilly course, with a 128km route starting and finishing in Bristol.